From the earliest days of the United States Mint, uniformity had been sought within coinage designs. For the first several decades in operation, this goal had been met with variable success. While most designs were fairly similar, small differences were often noted and because of the rapid pace of design changes, the uniformity was often short lived. The first true success in attaining this goal came in the 1830’s when Christian Gobrecht created the Liberty Seated design for use on silver coinage from the half dime to silver dollar. His design was based on a sketch prepared by Thomas Sully, which depicted Liberty seated on a rock, drawing inspiration from the depiction of Britannia on contemporary British coins. The Liberty Seated Dimes featuring this design range from common to ultra rarities and have become a series with a large and growing number of devoted collectors. The original obverse design for the series featured an image of Liberty seated on a rock, looking over her left shoulder and behind. In one hand she holds a pole with a Phyrigian or Freedom cap on top of it, while the other hand rests on a shield with the inscription LIBERTY on a scroll. The reverse design featured a wreath of laurel tied with a bow at the base. The inscription UNITED STATES OF AMERICA appears around and the denomination ONE DIME is within. The obverse design was previously used on silver dollars dated 1836 and would remain in use in somewhat modified form until the early 1890’s. After the first year of production for the Liberty Seated Dime, the first design modification would occur. Thirteen stars, representing the original thirteen states, were added to the obverse. The new design would be introduced in Philadelphia in 1838, where both large and small star varieties exist. In 1839, the stars were also added to the obverse dies that were being sent to the New Orleans Mint, the only branch mint producing silver coinage at the time. In 1840, another design change occurred, in order to improve the production quality of these coins. The most noticeable change was the addition of drapery at Liberty’s elbow, although other small alterations were made to the obverse. This design would remain in use until 1853. Proofs of these two varieties are sometimes available, but very rare (especially of the no-drapery type of 1838-1840), in virtually all grades. For some years, no Proof strikings are known to exist, while for other years only a few undisputed Proofs have been verified. Proof dimes dated 1838 to 1841 are represented by only a single example, the latter which even in circulated condition. At this point in the series, the silver content was reduced, a measure which was meant to improve circulation of silver coinage. To denote the change in weight, arrows were placed to either side of the date. 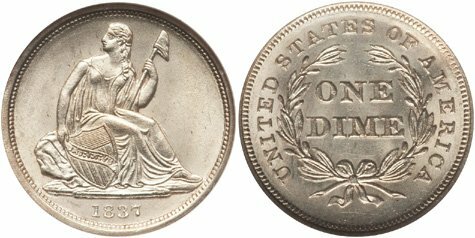 Coins were struck with arrows in 1853, 1854 and 1855, representing an important subtype of the Liberty Seated dime series. Proofs were also struck of this variety and like the 1837 no stars Proof, are very important as type coins for advanced collectors, while they are rare as well regardless of the date. In 1856, the previous design was resumed and struck until 1860. That year, the Philadelphia Mint introduced another design change for the Liberty Seated Dime. Although the seated figure of Liberty remained on the obverse, most other aspects were redesigned by James Barton Longacre. On the obverse, the previously present thirteen stars were removed and replaced with the inscription UNITED STATES OF AMERICA. The reverse design was completely redesigned, with the previous laurel wreath with an agricultural wreath. The denomination, ONE DIME was still inscribed at center, but in a taller font. In both 1859 and 1860 fantasy pieces were produced, struck using the obverse die of the previous type. While these are not official mint issues, they are popular with collectors since the pieces curiously do not list the name of the country from which they are issued. One more design change occurred in 1873, when arrows were once again placed to either side of the date. This time the arrows signified a slight increase in weight, following another adjustment to the silver content of the coins. Proofs of these two varieties, legend obverse dimes were specifically produced for collectors in reasonable quantities, and most dates are more or less easily acquired. In business strike condition some issues are major rarities, such as those from the Carson City Mint dated 1871-1874, with one of the most famous being the unique 1873-CC No Arrows Dime, the sole survivor from an original mintage of 12,400 coins struck before the change of weight was authorized. Other dates are readily available in all grades, up to the gem level, although some intensive searching might be required to find problem-free examples with good-eye appeal.